When Katy Perry, Radiohead and Ed Sheeran take to the Pyramid Stage next week, they'll get paid "less than 10%" of what they'd earn at other festivals. "We're not in a situation where we're able to just give people enormous amounts of money," organiser Emily Eavis told BBC 6 Music's Matt Everitt. "So we're really grateful for the bands that we get, because they're basically doing it for the love of it." Headliners at other UK festivals can earn upwards of £1m per show. Oasis were the first act to be paid a six-figure sum when they topped the bill at Reading and Leeds in 2000. Their fee was offset by a £5 hike in the ticket price but, ever since, such figures have become commonplace. In 2011, V paid Eminem £2m to headline its two sites. Rihanna, who played immediately before him, earned about half of that amount. 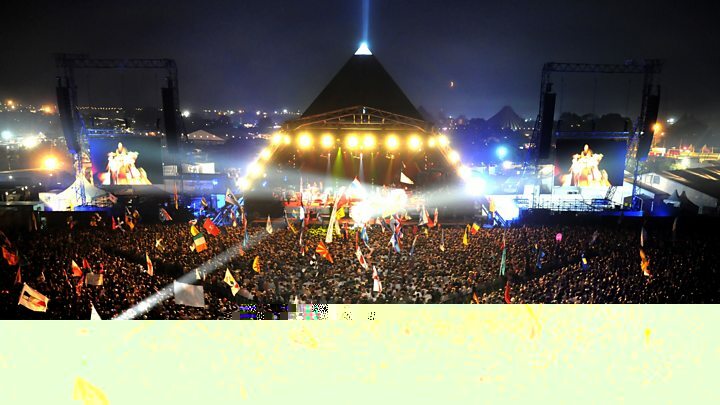 But The Rolling Stones are believed to have made a loss when they played Glastonbury in 2013, having spent money to build a catwalk on the front of the Pyramid Stage. The festival's founder, Michael Eavis, once revealed, "I paid £200,000 for Paul McCartney and for Coldplay, and although it sounds a lot, they could have charged me far more". In fact, Paul McCartney can charge up to £4m for an appearance, although his festival fee is likely to be lower. It's the Eavis's commitment to charity which allows them to drive prices down; with profits from the festival split between Oxfam, WaterAid and Greenpeace, amongst others. "We try to give £2m a year," said Emily. "In a wet year it's harder because it costs more, but we give as close to £2m as we can. "That's why we're not commercial, in that respect. We're not in the same bracket as everyone else when it comes to paying artists massive fees. "It's probably less than 10% of what they'd get from playing any of the other major British festivals. [So] Glastonbury relies completely on goodwill." Emily added that fans would be subject to increased security checks at this year's festival, following the terror attacks in London and Manchester. "Coming in will take a bit of extra time, because we'll be doing extra searches," she said. Organisers have also asked people to put luggage tags on all their bags, with details of their names and mobile numbers. As in previous years, the car parks will open at 2100 on Tuesday night (20 June) before gates open. Festival gates will then open at 0800 on Wednesday morning. However, there will be no entertainment or facilities (other than toilets) in the car parks and festival-goers will be expected to remain in their cars until the gates open. "We're working very closely with the police," said Emily. "We just want to make it as safe as possible."